This striking little monkey gets its name from the fantastic plume of fluffy white hair that encircles its black face. Ideally suited to life in the trees, their long limbs, claw-like nails, and long tail allow for leaping, running on all fours, and climbing like a squirrel. The cotton-top tamarin eats fruit, insects, new leaves or buds, small lizards and nectar. Its teeth are adapted to penetrate tree bark to induce the flow of tree sap, an important food source. These small primates spend most of their time in trees-running and leaping among forest vines and branches. Active during the day, they live in both humid and dry tropical forests in an extremely small native range in northwest Columbia. Cotton-top groups include 3-9 members; a mated pair and their offspring. Females give birth (usually twins) once each year. All group members help raise the young, although the group’s adult male usually carries the babies. Home ranges of neighboring groups overlap, and each strongly defends its immediate area. This species of tamarin is highly endangered. Their habitat is threatened by deforestation for farming, firewood, and housing, and from flooding due to hydroelectric development. They are also highly prized in the illegal pet trade. The size of the current population is unclear, with estimates as low as 6000 individuals. Head & body: 13-15 in. Average weight: less than 1 lb. When alarmed or excited, cotton-top tamarins raise the hair on the crown of their head and stand up tall to make themselves look bigger. Rather than expose themselves to predators on the forest floor, cotton-top tamarins get water by licking leaves that are wet with rain or dew. Cotton-tops use facial expressions and at least 17 different vocal sounds to express themselves: trills (for solo activity), clucks (for foraging), long calls (for caution), and whines (for contact). Columbia is one of the most biologically diverse countries, second only to Brazil in overall plant and animal species. As a group, cotton-tops work together to care for their young. Adult “helpers” stay in the family and learn to parent before having babies of their own. More than 75% of this species’ original habitat has been lost. The few populations that remain are small and restricted to isolated areas. 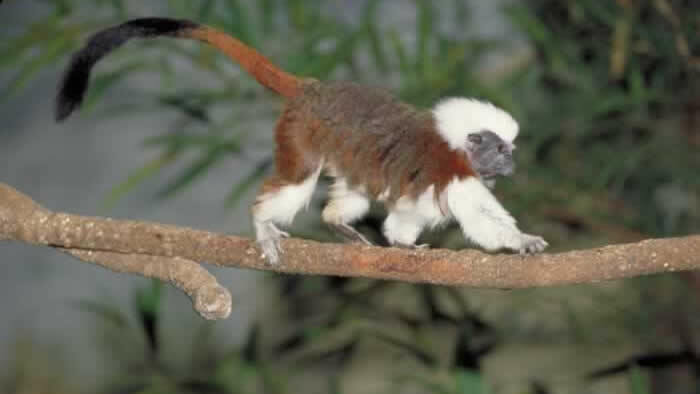 Recent conservation efforts have included surveys to estimate the number of cotton-top tamarins remaining in the wild. 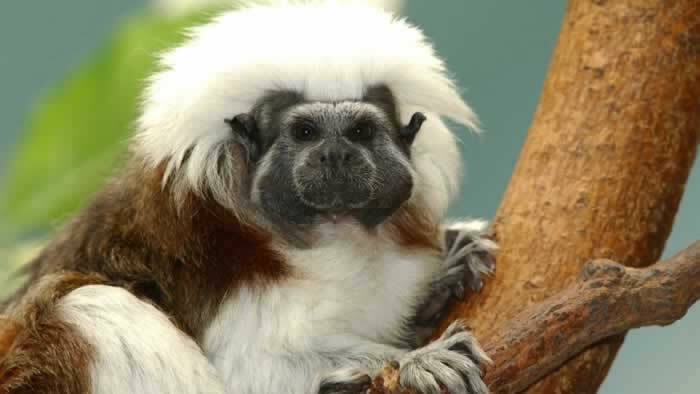 In the past, wild cotton-top tamarins were captured to send to other countries for the pet trade and other purposes. Today, this type of activity is illegal. You can help threatened and endangered species by responsibly choosing a pet. In human care, the cotton-top tamarin is managed for breeding purposes by a Species Survival Plan (SSP). Under this plan, the coordinated efforts of several zoos throughout the United States help maintain the captive gene pool for the future aid of the wild population.